All aboard the Nursery Rug! Thomas the Train made it cool for young children to play with trains. 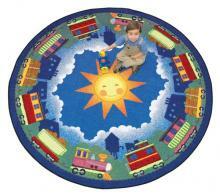 We have created the Nursery Rug to keep your young students' love for trains moving along the education tracks. 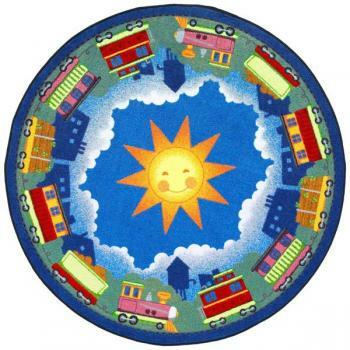 This circular rug displays eleven colorful trains that form the border around a brilliant yellow sun that smiles at the children. You can discuss train topics with your students and ask questions about the sun, making this both a visually pleasing rug and an effective teaching tool. The Nursery Rug is easy to clean. We apply anti-soil and anti-stain treatments to help you remove the most stubborn mud prints and juice spills. After wiping the stains away with a damp cloth, you keep the Nursery Rug in excellent condition by quickly running a vacuum over the surface. We construct the rug with tightly woven fibers that provide durable support, as your children gather around for story time. Our dedication to providing a safe rug that exceeds all federal indoor air quality standards means your students will not inhale loose rug fibers or ink dye fumes. Teach your young students about trains and the benefits of utilizing green friendly products.